The mooring at Brigg can not classed as salubrious. However the locals, at least all those I saw walking the towpath, were friendly enough and would say hello or stop for a chat. On the two nights I stopped there I had no problems whatsoever but beware of weekends. It is just one minute away from Tesco and filling station and handy for the local shops. A reasonable start and another trip around the island to face the right direction for Ferriby. Brigg was at one time called Glanford Bridges and these are the two that are on the main road. Just the other side of the town bridge is the rowing club where I ended up on Monday. 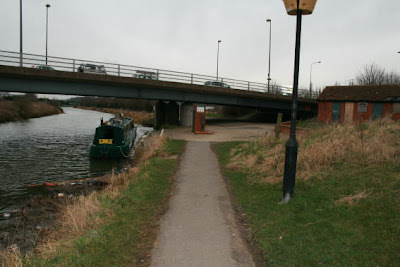 The second bridge is next to the Leisure Centre with some gated moorings to the right and the M180 bridge beyond. There is not a lot of interesting items on the voyage but there is a bridge. And shortly afterwards there is another. After two and half hours steaming the boredom is broken by ---- a bridge. Not long after one arrives at South Ferriby. Chatting to Mick the lockkeeper I am assured that the Ancholme is much much nicer in season and full of boats and people enjoying themselves. Sunshine and a bit of warmth would certainly put a different light on things I must say. Apart from the extremely helpful Mick there is a similarly helpful and accommodating chandlery who do their best to fix you up with what ever you need. Paddy and his hard sell method of giving 10% sold me a VHF radio which I was going to get but with the cost of £80+ to stay on the Ancholme for a month I found a week was more than enough. I decided to get one after the extremely gentle tutting from the rescue volunteer. Next step – The Humber at 0830 tomorrow. Fascinating stuff.....and a whole world away from my base on the Shroppie!